With so much hype about Royal Caribbean's Allure lets not forget that many other cruiseline's are debuting new ships to the Caribbean itineraries. Celebrity Eclipse has been in service overseas since April of 2010 but it now has a new home port, Miami Florida. The Eclipse is the latest upscale Solstice-class ship which is known for its sophistication, great food and service, contemporary design, and enriching on board activities. Another great feature of this sleek ship is that 85% of all of the staterooms have incredible veranda views. With its new home in the Port of Miami, the Eclipse will be offering both Eastern and Western Caribbean cruises. There is great pricing on some of the sail dates so feel free to call us at 1-877-344-SHIP(7447) for more information. Below is a short video from The Travel Channel, aboard this amazing vessel. The Allure of the Seas arrived in its home of Port Everglades just a few days ago. The Today Show on NBC had a great segment today aboard this spectacular ship. 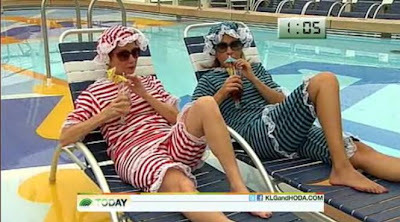 Kathie Lee and Hoda took a tour of some of the many activities featured on the Allure. Take a look at the segment from the Today Show's website, by clicking the image below. If you are interested in experiencing the Allure for yourself, call us anytime at 1-877-344-SHIP(7447) and we will find you an amazing deal. The Allure is on its way! Do you want to go on a great vacation, but you would prefer to stay on land? Well we don't just have great cruise deals, we have some amazing land vacation deals as well. Click the picture below for some unbelievable deals on land vacation getaways. There's just a few short months left to enter our win a cruise sweepstakes! This only takes a minute or two to sign up and you could be a lucky winner. We love sharing all these great deals with people. 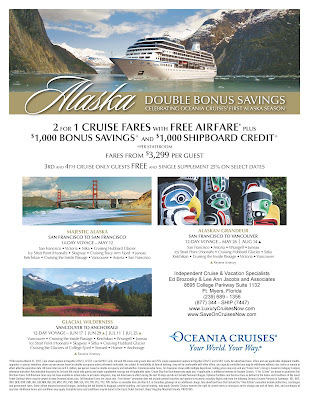 Click on the picture or link below to find out how you could win this cruise vacation! This is not to be missed! We have some great deals this week. Call us at 1-877-344-7447 to take full advantage of these great offers. Whats your favorite thing to do while on a Cruise Ship?